Get a cute collar/harness and leash! 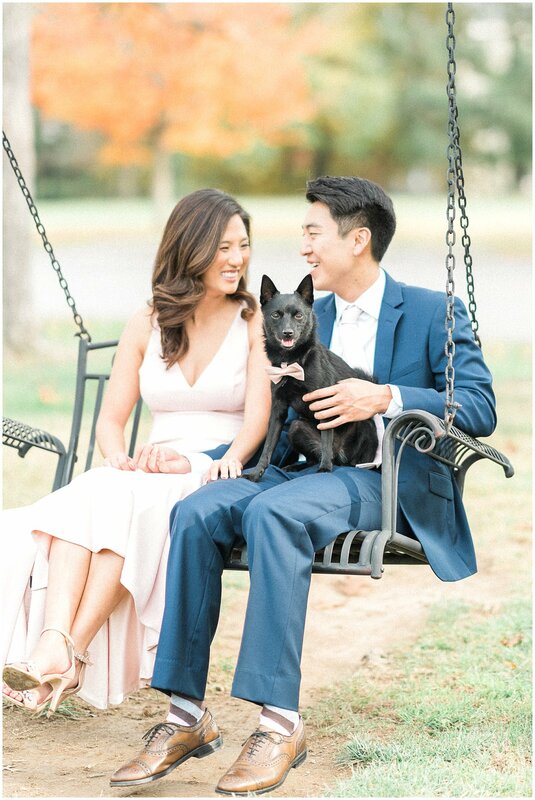 Utility harnesses and retractable leashes have their uses, but since you and your partner are dressing up for your session, why not use this as an opportunity to buy that bow tie you’ve been eyeing for Fido? One of my favorite Etsy shops that sells cute dog gear is LearnedStitchworks. I’ve been purchasing Nugget’s bow tie and harnesses from Karen for years. A simple, thin leather leash or nylon leash in a neutral color works well to hide or disguise in pictures as well. Want to go all out? 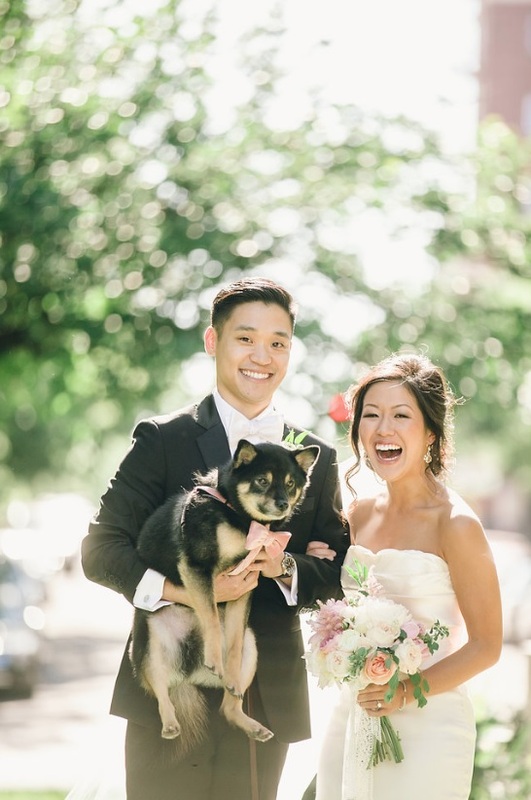 Consider asking your florist to make Fido a floral garland! Just be sure they use pet-friendly flowers in case some get ingested. While your at it, a trim at the groomers if that’s part of their usual maintenance routine is not a bad idea. 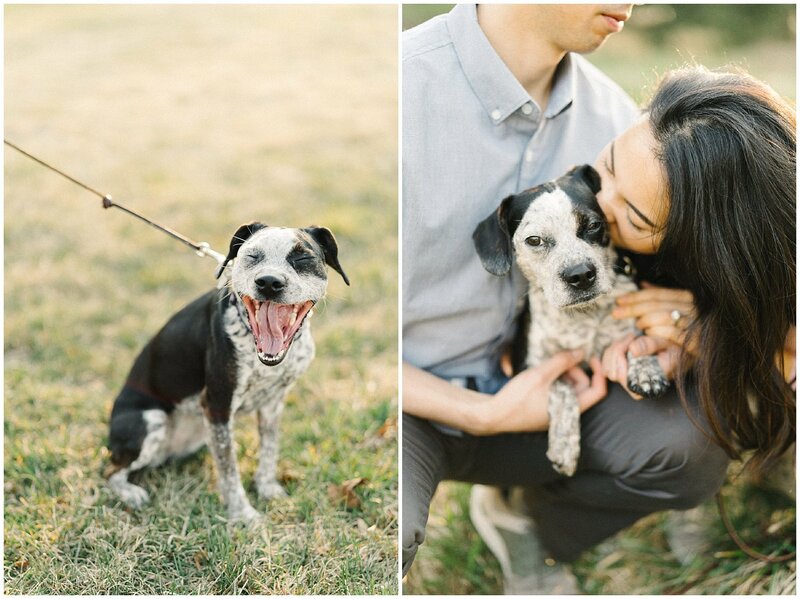 How dapper is Sawyer in his bow tie and handkerchief in Jon and Carina’s engagement session? I may ask your friend or family member to stand behind me and hold a treat over my head as I shoot so that we can try to get the dog to look at the camera. 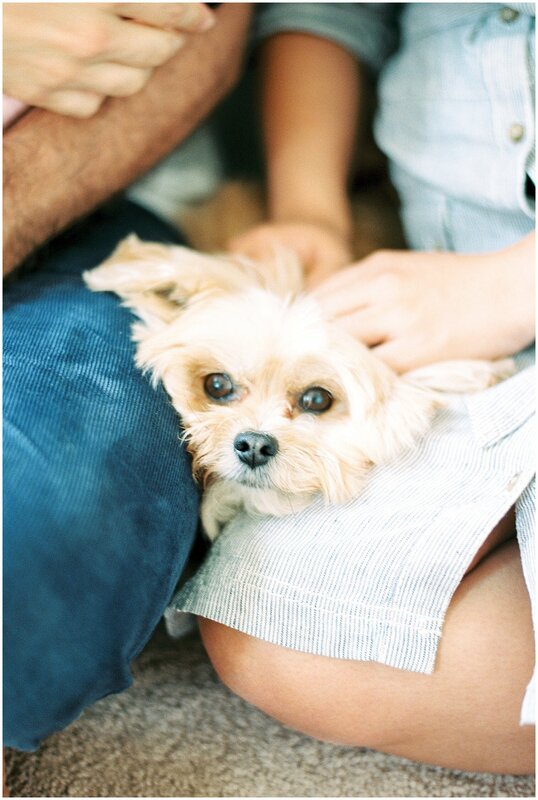 No worries if your fur baby doesn’t look at the camera though- candids are equally adorable. I mean, how cute is it when Fido slobbers on your face with doggy kisses!? Not so much? Oh well, I tried. PS- Isn’t Cookie such a HAM? The cutest! Depending on your session location, it may make more sense to have your friend or family member just pop in for 20 minutes or so with the dog, and then bring your pet home afterwards. Especially in the summer, it’s more comfortable for everyone and we ensure that nobody gets dehydrated from the heat. Some animals are not comfortable outside of their “territory” or in new, unfamiliar places with strangers. 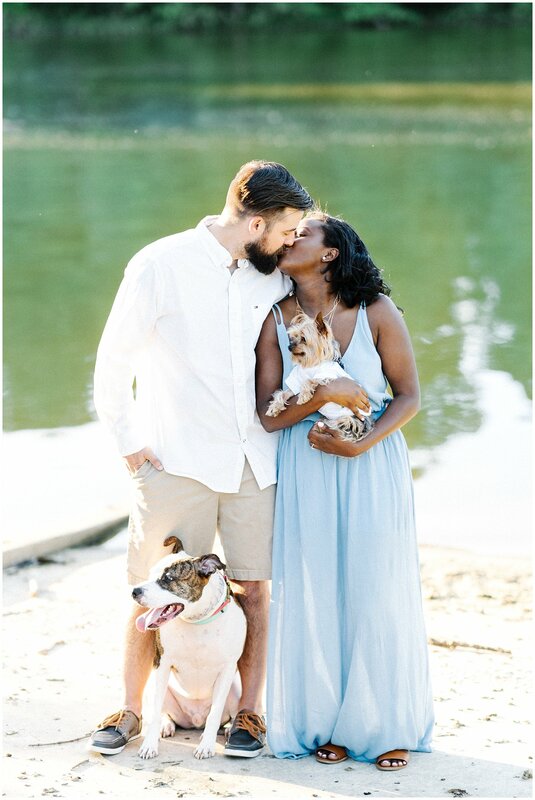 This is perfectly fine, and we shouldn’t push your fur baby outside of his/her comfort zone for your photo session. Consider an in-home lifestyle session, where your dog is able to come and go as it pleases in the comfort of his/her home. Not sure what it might look like? 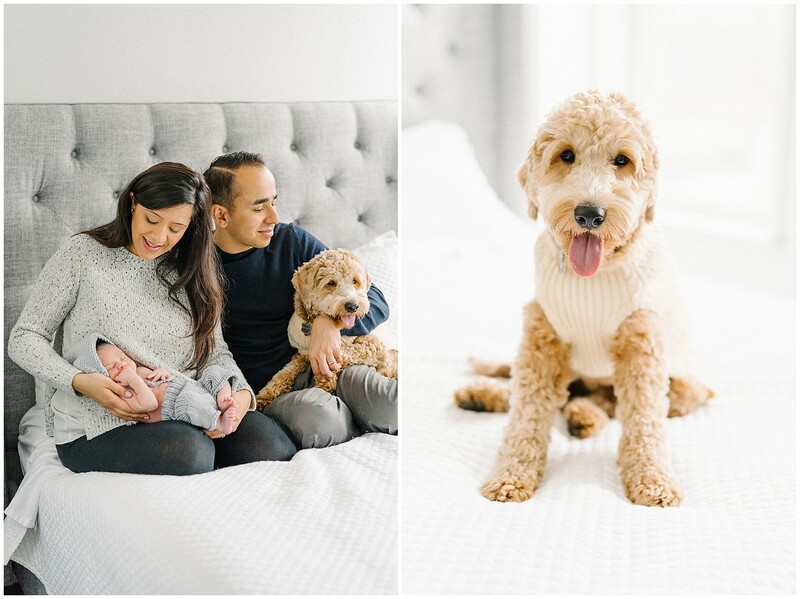 Check out Murphy in his human brother’s in home lifestyle newborn session, or Alister with his furry nannies!